On her sixtieth birthday, Auntie Poldi retires to Sicily, intending to while away the rest of her days with good wine, a view of the sea, and few visitors. But Sicily isn’t quite the tranquil island she thought it would be. When her handsome young handyman goes missing—and is discovered murdered—she can’t help but ask questions. Soon there’s an investigation, a smoldering police inspector, a romantic entanglement, one false lead after another, a rooftop showdown, and finally, of course, Poldi herself, slightly tousled but still perfectly poised. This “masterly treat” (Times Literary Supplement) will transport you to the rocky shores of Torre Archirafi, to a Sicily full of quirky characters, scorching days, and velvety nights, alongside a protagonist who’s as fiery as the Sicilian sun. 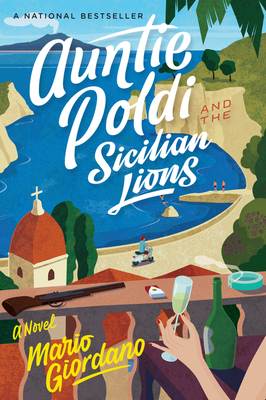 A Washington Post "Beach Read That Will Bring You More Pleasure Than Guilt"
"Auntie Poldi and the Sicilian Lions by Mario Giordano follows a woman from Munich back to her husband’s family village, Torre Archirafi, in Sicily. Auntie Poldi is 60 and wants to retire, but this is no sweet return: Isolde “Poldi” Oberreiter intends to drink herself to death, and sooner rather than later. Despite her malaise, Poldi is tugged back toward life by, yes, a murder. The handsome police detective investigating doesn’t hurt, either. Giordano keeps the tension in check with an anonymous narrator whose affection for his eccentric relation can’t be disguised. "—Washington Post, "6 beach reads that will bring you more pleasure than guilt"
"In this light-hearted mystery, a Bavarian widow moves to Sicily and rediscovers her love of living...Big-hearted and funny, smart and escapist: it’s like taking your own Italian vacation. "—Modern Mrs. Darcy, "Summer Reading Guide"